Ok – it’s time to get into the extra-cheesy holiday recipes. Really, I just wanted to post a recipe for Vodka Sauce, but perfecting the vodka…(sauce) recipe, combined with a couple of rounds of Santa Claus, Go Straight to the Ghetto on Christmas Day, we are now well into the Harlem Holiday Spirit! Prepare manicotti if making from scratch (ok, I promise a recipe for this some day. In the meantime, see what your local Italian deli has available. Stuffed shells would be awesome here too). Wash and dry kale, and cut the rib off each leaf. Toss in a bowl with olive oil, vinegar and a light sprinkle of salt and massage lightly to coat. 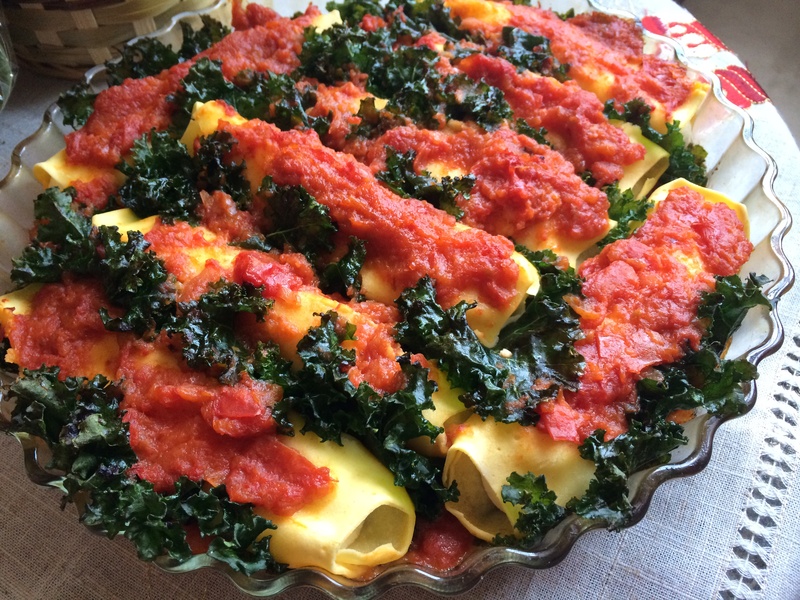 Partially wrap each manicotti in the seasoned kale leaves, leaving to top edge bare. Patching a few leaves together here is fine – try to get a lot of the nice frilly leaves top-side since these get wonderfully crunchy when they bake. Lightly coat baking dish with olive oil and cover bottom with a thick layer of sauce. 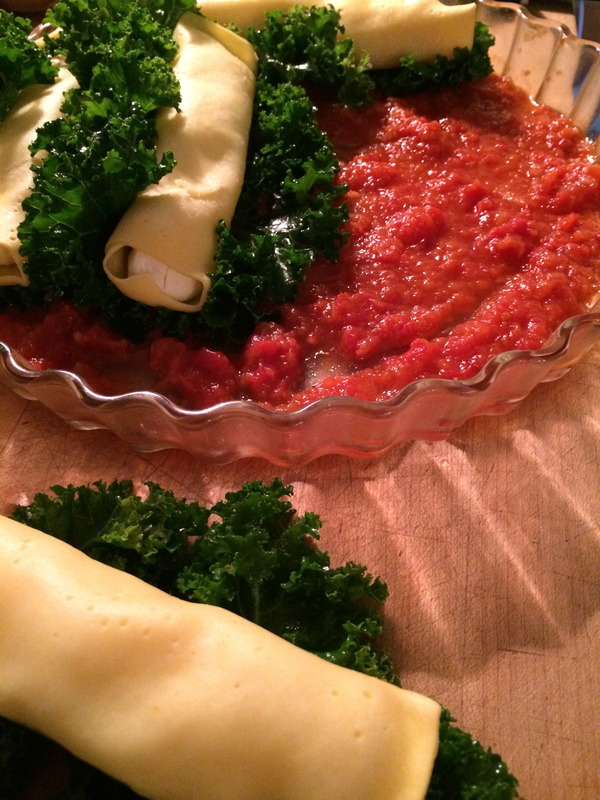 Arrange kale-wrapped manicotti in dish and spoon remaining sauce carefully over bare manicotti’s, leaving the edges to peek out a bit. Lightly cover top with aluminum foil (do not tuck in). Bake for 30 – 35 minutes in 350° oven, until manicottis are hot through, sauce is bubbling, and kale is crunchy but still green.